"If you’ve been following the web chatter about the 2009 Nissan GT-R, you probably already know that the long-awaited Japanese supercoupe made its U.S. race track debut during last week’s One Lap of America competition. 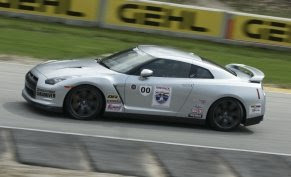 And if you know that, you may also know that the GT-R finished 11th overall, in a field of 72 entrants. This has led to a lot of dialogue in the blogosphere, much of it along the lines of “if this car is so hot, why’d it only finish 11th? Why didn’t it win the whole thing?” "
"The GT-R’s strength is fast tracks, and nowhere was this more apparent than Road America, the great four-mile road course in Elkhart Lake, Wisconsin. At the end of the three-lap run—the standard One Lap road course time trial—the GT-R had the fourth fastest time of the day, trailing only the ACR Viper, the championship-winning Porsche Turbo, and the turbo Z06 Corvette. "